Many riders use a mistral board, I am a fan of Chris Lockwood his designs too. I see a very stable ride and not supersensitive for fins, though this is a little gamble for me. From boardposition on the water there seems to be enough opportunity for rougher-highwind conditions. It is amazing this board is for sale, most others are customs. For example the fastest board of Antoine, which probably is a Christophe Fiorentini board. I like the look of the Neilpryde, Loft and Severne (based on ranking). All 3 sails have good downhaul, not too much though but with a extreme belly. Is this is extreme belly needed for the tiny turbulences at the first meter from groundlevel, eliminate drag?? Or is it just lift that is required for such a deep downwind course? When looking to my own trim I use a bit more downhaul and more outhaul (flatter sail with more loose leech). I think it has to do with the extreme course and deep downwind angle. 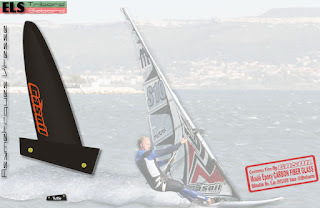 The Gaastra Sail surprised me, the performance we see by Cedric Bordes is outstanding! Is this the recordbreaking Gasoil design? I heard of Gasoil before, but what an amazing speed by Antoine, Anders, Patrick, Farrel and Nick (Lena too?). If I see it right it is no widebase design, so old fashion ;). Though Jurjen van den Noord is the exception, using mXr Fins, which are more widebase design, no problem for 50kn+ and congratulations the dutch fans are extremely proud!!!! In the end I wonder which design will be the favorite, it is interesting to see Antoine changed from mXr to Gasoil yesterday and we see numbers never thought possible before. Is there less need for extreme low center of effort (advantage widebase fins) on the Luderitz channel? Looking to the latest postings there is a new trend. Widebase should be a bit more draggy, though the low center of effect normaly gives plenty of control back making the ride more stable, hence widebase fins drag/lift lower and faster. If the Gasoil fins has equal amount of lift (without lifting the board out of control in gusts) I can imagen a small advantage +-1% though, that is what it takes for records. If something interesting shows up, you read it here.